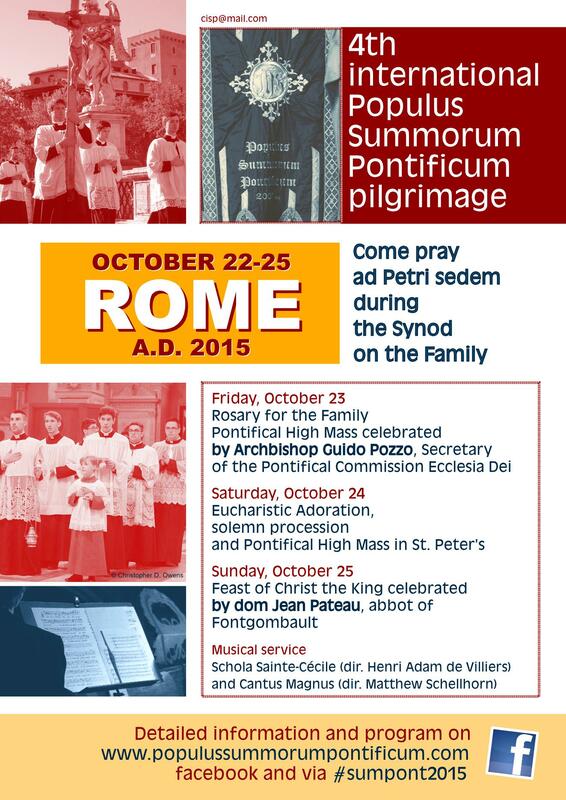 The fourth annual pilgrimage to Rome for supporters of Summorum Pontificum will take place Thursday, the 22nd of October through Sunday, the 25th of October, 2015. The pilgrimage will begin, as in every year, with Pontifical Vespers in the Personal Parish Church of SS Trinità dei Pellegrini and will conclude with the celebration in the same church of the feast of Christ the King, on Sunday the 25th of October. This year the pilgrimage will coincide with the closing of the Synod on the Family and so the prayer of the pilgrims will be offered, in a particular way, for that the Church will once again find home for our “little domestic churches” (Familiaris Consortio, 51) under the protection and guide of the Holy Family of Nazareth, model of conjugal life, of education and sanctification, so that new generations of catholic families might be the leaven of the new evangelization. Saturday the 24th of October, the pilgrimage will arrive at its culmination with the solemn procession towards St Peters and the celebration, at 12 Noon, in the Vatican Basilica of Holy Mass in the Extraordinary Form of the Roman Rite. The CISP would like to warmly thank His Eminence Cardinal Comasti, Archpriest of St Peters for the generous solicitude with which he agreed, far in advance, to the date and time of the celebration of the Mass. To improve the preparation for the pilgrimage, the CISP has decided to enrich its team, even establishing a musical coordinator, a press officer and national delegates. Finally some pilgrims which have participated in one of the previous pilgrimages, have agreed to become delegates for the pilgrimage for their own countries and for their linguistic groups. Their job will be to disseminate information which regards the pilgrimage in their respective countries and language groups. This entry was posted in #sumpont2015 and tagged 2015, pilgrimage, synod. Bookmark the permalink.